Got my Burlesque glitters. Got the rest of the Burlesque collection, too. 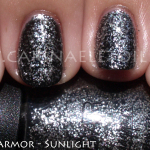 I was thrilled because OPI really outdid themselves on the glitter collection for Christmas 2010. I hate glitter, but I had to have these. Anyway, the one color that really had me holding my breath was Tease-y Does It. I was like, “Shut up. Shut up. No, I don’t.” Conversations with yourself really doesn’t bode well, but at least I wasn’t talking out loud. Then I started doing a re-org of my 2 Helmers (I am going to need a 3rd now, btw) and started a drawer for Nubar…What is this? Raspberry Truffle? It looks like…No, it can’t be. Ce n’est pas vrai! Non. Mais oui, mes amies. Mais oui. 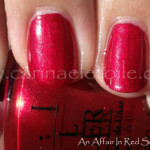 I actually dare to call OPI’s Tease-y Does It a dupe for Nubar’s Raspberry Truffle. Don’t weep if you can’t get Tease-y Does It. Nubar still has Raspberry Truffle on their site. OPI’s formula was the winner of the two. While both were easy to apply with no problems, RT tended to take about five minutes longer to dry than TDI. Check out the dupeness for yourself – RT is on the pointer and pinky while TDI is on the ring and middle fingers.